‘I don’t want to go bowling!’ My son stamped his foot. ‘When you’re in France,’ I said in my best, all-knowing fatherly voice, ‘you do what French people do.’ I ruffled his hair and he pulled away. Well, I guess he had a point. When the Bullhogs visit the cousins in France we do whatever the French do, not just what your average American tourists would. We do family things, like playing miniature golf and taking walks in the countryside. Kid things, like making lavender water and catching hummingbird moths and sometimes going to see the donkey who lives in a field down the way. It’s just not normal. And for food? If we’re not cooking at home, we often go out for pizza – which I don’t think of as particularly French – but it seems to work well for everyone. 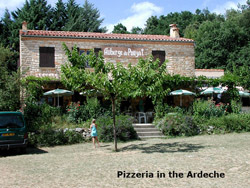 A few years ago, we found a pizzeria with a view of the Ardéche River as it flowed through the town of Aubenas. The kids played nearby in the grass. In a happy fug, we sat back devouring woodfired pizzas that came out thin and fresh and delicious while the town’s stone walls and turrets turned brilliant yellow in the evening sun. For a moment, peace reigned. But bowling? Just once and for a change, my son and I are in agreement. Here’s my take on a hot French pizza. 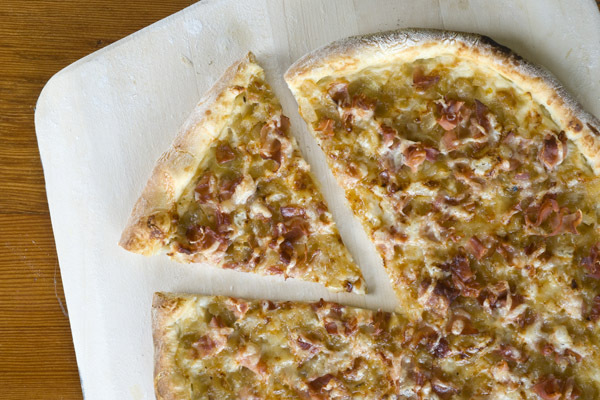 The crust is enriched with egg and butter to complement the pizza’s creamy style. Onion is slow cooked for sweetness. And the prosciutto? Okay, it’s not French at all, but it’s so good on any pizza; in the absence of real French bacon, it works beautifully. Enjoy! Make the dough: In a mixer, use a flat beater to cream together the butter and egg. After a minute, add a small amount of flour and a little of the water, and alternate small amounts of water and flour until all is incorporated. Put in the salt and the yeast and beat for one more minute. Now switch to a dough hook, scrape the bowl and the beater, and run the mixer on low for 10 minutes. This dough is too wet for the dough hook to pick it up all the way, but no worries. 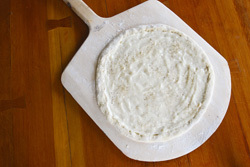 Clean off the dough hook, cover the bowl and let dough rest for an hour at room temperature. Shove the dry scraper under the edge of the dough and fold over the top. Do this quickly and go around until there are several folds of dough in a mound. Sprinkle more flour as necessary to keep everything from sticking. Knead for a few minutes with your hands, keeping flour on the dough. Put the dough back into the mixing bowl, cover and let rise at room temperature for 2 ½ hours. 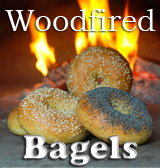 For woodfired pizza: Start your fire. By the time the pizzas go in, the fire should be at least 2 hours old. Build a fire in the center of your oven, and in the last 30 minutes, move the fire side to side to heat the bottom tiles. Add 6 well-seasoned sticks about 1½” in diameter 10 minutes before firing the first pizza. When you are ready to bake, spread your mature fire into a horseshoe shape at the back of the oven, using the 6 sticks to maintain the fire. Add 4 more sticks at this point and brush the center floor of the oven well. The side walls of your oven should be turning white if your oven is up to temperature. Form dough balls: Turn dough onto lightly floured surface and divide into two balls. Let dough balls sit under a cloth until ready to use. Make the toppings: Melt butter over medium heat in a sautee pan, add chopped onions and raise the heat to medium high. Quickly stir as onions brown, getting uncooked onions down to the pan surface and, when all the onions are lightly browned, turn the heat to low. Let simmer in their juices for at least 30 minutes. Meanwhile, pull apart prosciutto slices and cut them into 2” pieces. Fry for 30 seconds to a minute over high heat. Let cool and then chop or cut into bits with kitchen scissors. Make the cream sauce: Melt butter over medium low heat in a sauce pan, add the flour and stir to make a roux. Add a few tablespoons of the milk and, when hot, stir it into the roux. Add more milk ¼ cup at a time and incorporating when hot, until you have used all the milk. Make sure before any cold milk is added you have smoothed all the lumps to get the best results. Add salt and pepper, remove from heat and cover. For baking in a conventional oven: Use a pizza stone or put quarry tiles in a 3×2 pattern on the center rack of your oven and preheat for 30 minutes at 425º. Smooth half the cream sauce to the rim of each pizza with the back of a spoon. 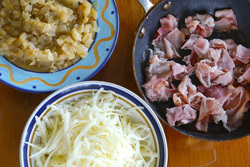 Spread evenly with half the onion and half the prosciutto and then sprinkle with half of the Comte cheese. Bake the pizzas: In the woodfired oven this pizza will take 6 or 7 minutes, and needs to be turned after 3 minutes. In a conventional oven, it will take 10 to 12 minutes, and needs to be turned after 5 minutes. Slip one pizza at a time directly onto the clean woodfired oven floor or quarry tiles (or pizza stone). Turn with a metal peel or 2 metal spatulas, remove when done to a round metal pan and let sit 5 minutes before slicing. Enjoy your pizza. Oh, I mean – Bon appétit! It’s such a French delight, after all. They even have “pizza” in Turkey, which we enjoyed while we were there. Love your site! Can you come cook for me? I just received your comment on Foodbuzz and had to check this recipe out. Last summer I was absolutely obsessed with thin crust pizzas. We don’t have a wood-fired grill so I experienced with various doughs (with mixed success) on our gas grill. This recipe looks scrumptious! Your dough recipe looks easy so I will try this soon. I actually did have a flatbread pizza at a French restaurant in Chicago last year, come to think of it, with ricotta, sliced almonds and honey (more as a dessert). Not sure how authentic but very good. I like the fact that there is no tomato in the sauce – will keep it on the record! Hope to have a wooden fire oven one day! Cons! That sounds like a super super beautiful pizza! I’m in France right now so Im trying to make what French people do to. Sounds like this is defiitly one of them! Ok, now I’m salivating. This one is too tempting. Sounds like a great combination. You’ve got me wanting to start cooking right this minute. This pizza is cooking right now and smells fantastic! 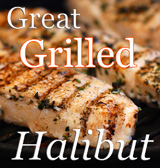 Serving it with a salad and a cool glass of viognier…can’t wait! The last picture especially got my mouth watering! Looks delicious!! looks wonderful would love some of this one! Great pizza. Different sauce too.